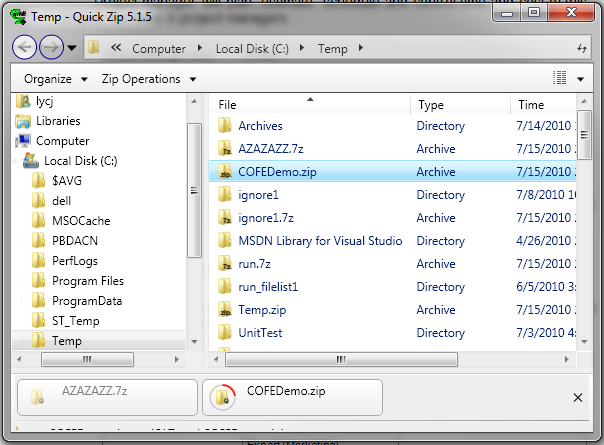 Found 12 file extension associations related to QuickZip and 2 file formats developed specifically for use with QuickZip. Allows you to work with 22 encode and encryption formats and 44 archive extensions. Including the popular 7z format. Run automated backups and other operations using the powerful aks and akp scripts. Advanced file list support, including the highlighting of files that match the user defined filter. Thumbnail support to display all pictures in the archive. Drag and drop files and directories from file list to explorer to extract or add. Context menu support to provide operations directly from the menu, without having to start the main program. Search in Archive - Search files in archives based on the name, directory, size and date. Archive Finder - Look for archives by searching for the files that you are looking for. Multi Extract - Allows you to extract multiple archives at the same time. Virus Scan Support - Automatically scan for viruses every time you extract using your anti virus software or the included free Clam-AV plugin. Mass Renamer - Simple but powerful tool that allows you to rename a group of files using masks. The QuickZip software seems to be old or discontinued. If you need more information please contact the developers of QuickZip (Leung Yat Chun Joseph), or check out their product website.